Do you ever see the perfect pair of trousers but there a bit too big at the waist? I was given these amazing trousers by The Boyfriend’s mum but they sat more on my hips than my waist as they should. 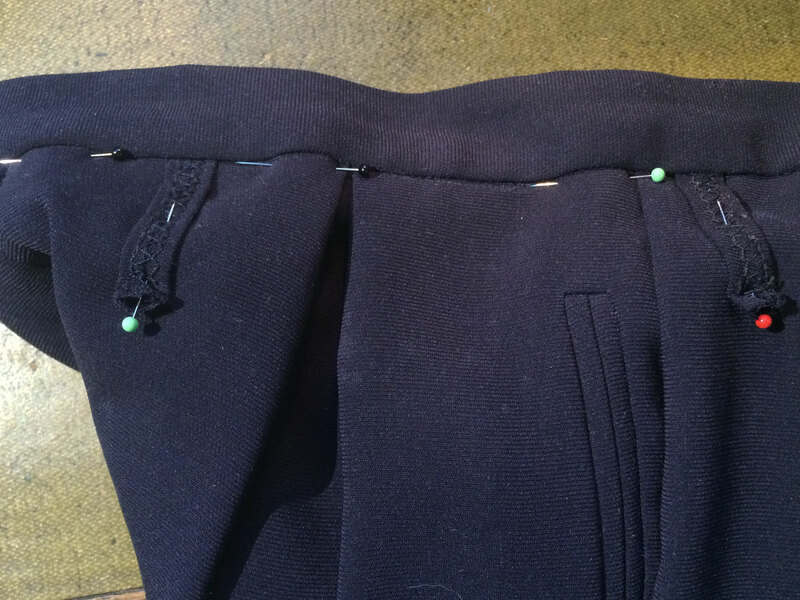 I thought I’d do a tutorial on how to alter the waist band of a pair of trousers in case you wondered how to do it. I would say a helpful step first of all is to take photos of the waistband, including belt loops, buttons, button holes, hooks and eyes and zips, so you have a reference to look back on in case you can’t remember what went where. 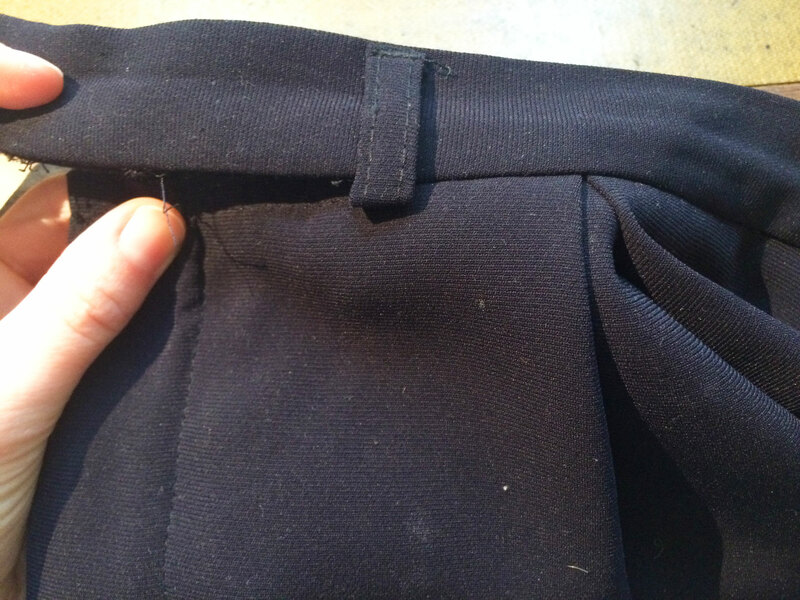 Then you need to unpick the existing waistband from the trousers. I unpicked the inside of the waistband then the outside. 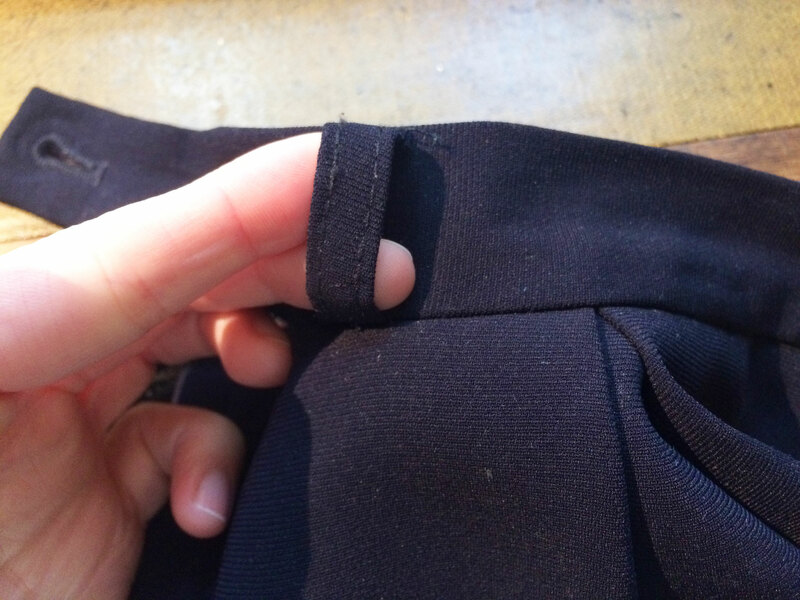 When I then moved to the outside seam of the waistband, I encountered the belt loops. I decided to unpick the stitching attaching it at the top of the waist band rather then the bottom, so they would still be attached to the trousers and I wouldn’t have to worry about where to place them. You may have to take them off completely if they are entirely attached to the waistband, in which case I would suggest putting a mark, with chalk or a pin, on the trousers where each one was. 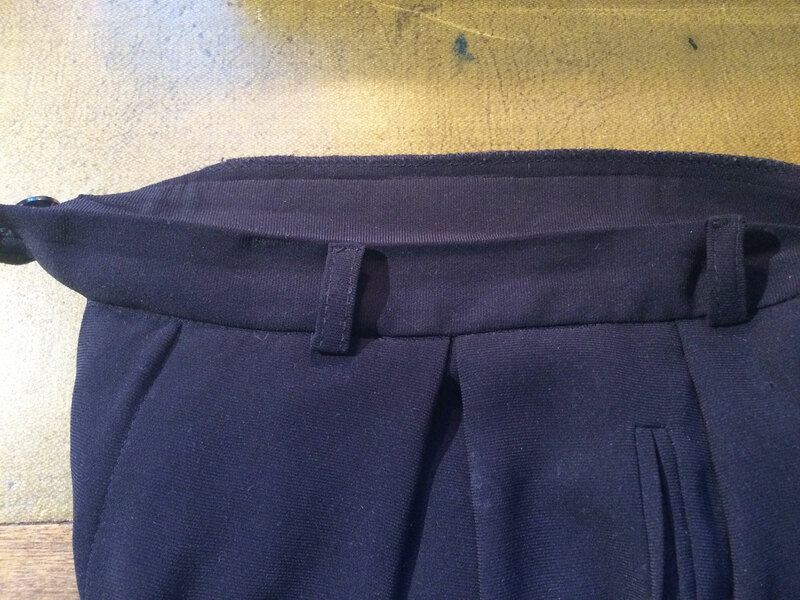 You may want to change the placing of the belt loops if you’re taking the trousers in by quite a lot, so removing them would be helpful anyway. 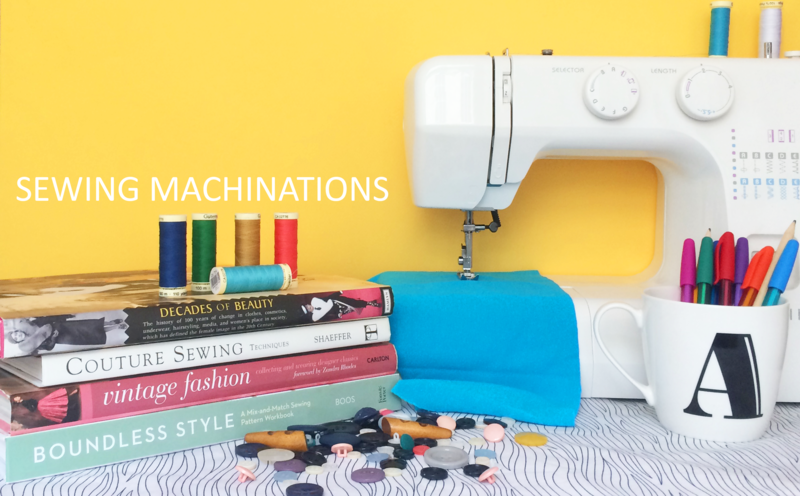 You’ll want to leave button holes intact if you can, if you hate sewing them as much as I do! 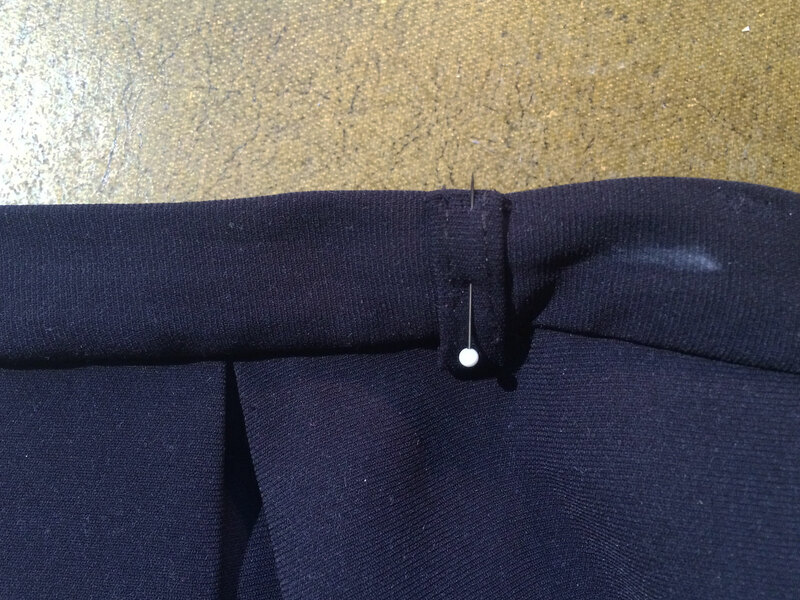 This is assuming you’ve got buttons and not a jeans rivet, as I had with my corduroy shorts/skirt refashion – I couldn’t take off the rivet so made a new button hole once I’d resized the waistband. With this pair of trousers, there was a button and button hole on both ends of the waist band, so I knew I would have to redo one of the button holes, once I’d cut it off to shorten the waistband. 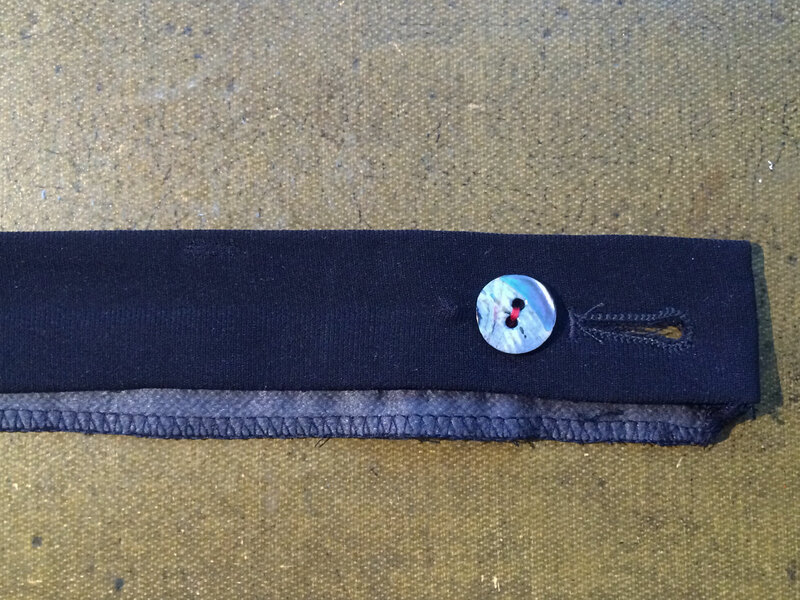 If you have the same set up, it may be worth making a note of the position of the button and/or buttonhole from the edge of the waistband so you have an idea of where to put them back. You’ll then want to try on the trousers inside out and pin down the side seams, and maybe the back seam too, if you’re taking out a lot, how much you need to take out of the trousers. I tried mine on before I unpicked the waistband too, and measured I needed to take out a total of 8cm – this meant I could then roughly pin 2 2cm tucks on the side seams, then try them on and taper the 2cm out towards the existing side seam – you’ll want to do a shallow taper so you don’t end up with what looks like a pleat. If you try them on and measure the amount to take out, then you will also know how much to reduce the length of the waistband by. 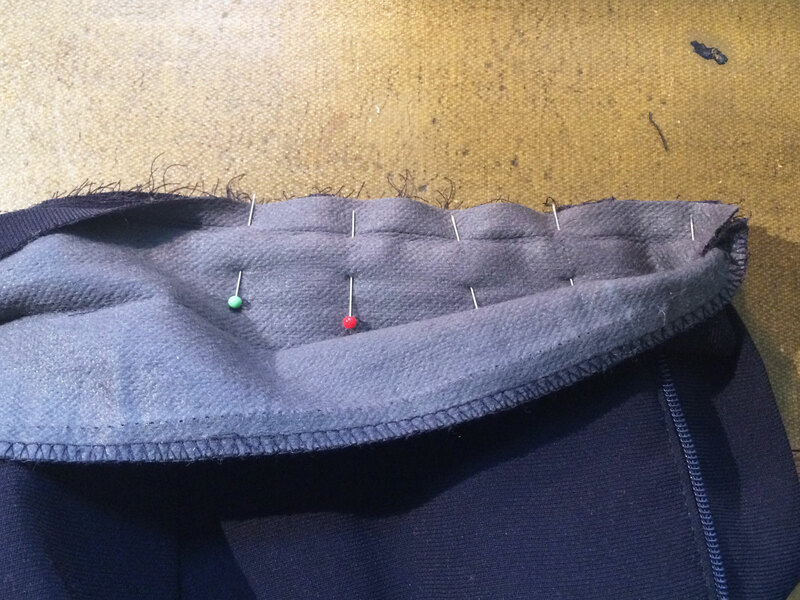 The stitching line you can see to the left of my pin line is for the pockets – you’ll want to plan where you sew your new seams so you don’t interfere with pockets or existing pleats. 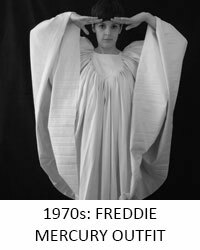 You might want to make new pleats instead of taking in at the seams, to make more of a design feature of your alterations. 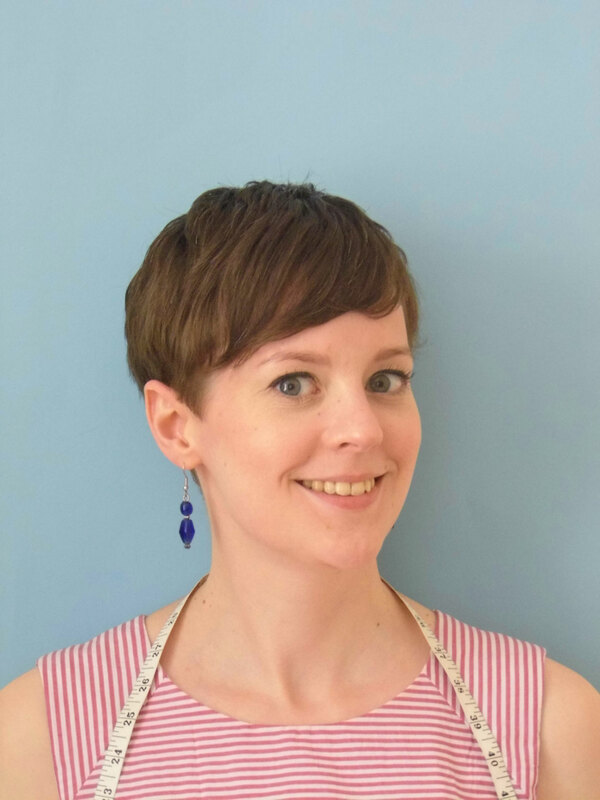 Once you’ve sewn your new seams and again tried them on to check your alterations are good and don’t look weird, or obvious – unless you want them to be obvious! You’ll then need to reduce the length of the waistband. 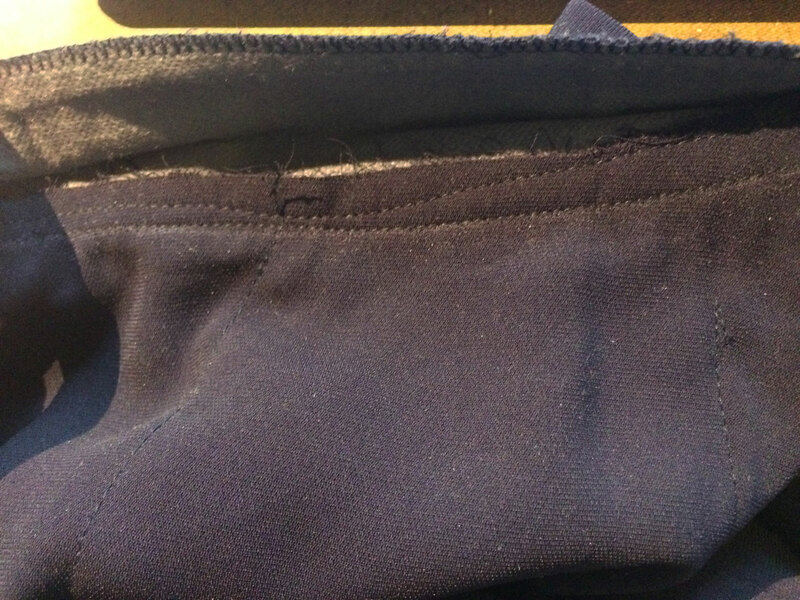 Draw a chalk line where the new end needs to be, then flip the waistband inside out and sew the new seam – you can see how I lost the buttonhole. Now all you need to do it reattach your waistband. 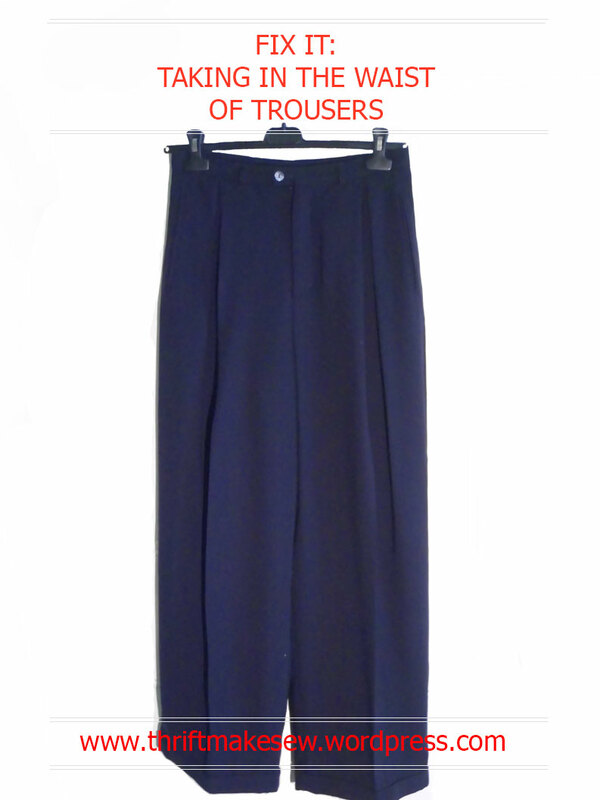 You’ll almost certainly want to reattached the outside half of the waistband to the right side of the trousers first. You can see below that I’ve pinned the right side of the waistband to the right, outside side, of the trousers. 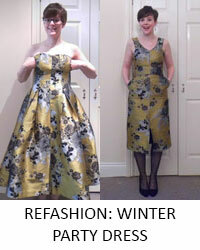 You can actually see the original stitching and fold line on the waistband – I followed this for my 1cm seam allowance. 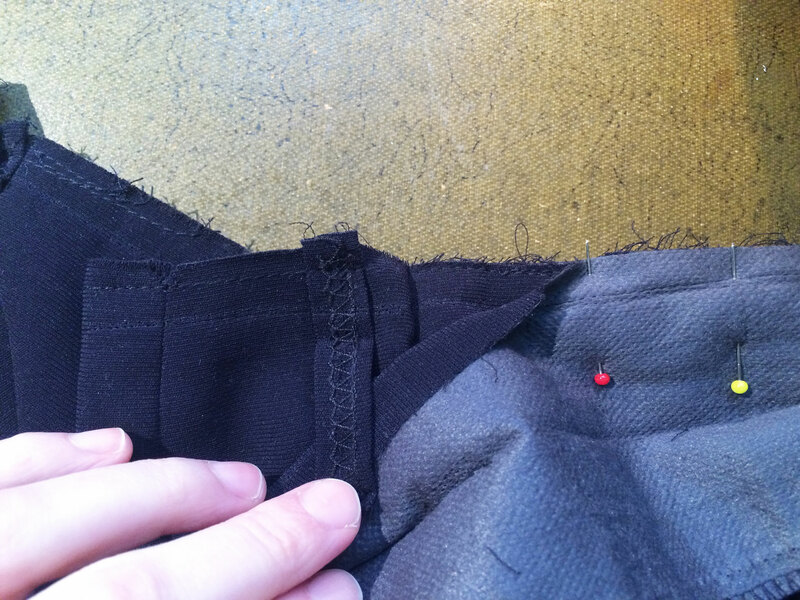 If, like me, you left your belt loops attached to the trousers, you’ll need to make sure you pin them out of the way when sewing this seam – there’s nothing more annoying that sewing a beautiful seam (and it’s always the best seam you’ve ever sewn! ), only to have to unpick parts of it because you’ve caught your belt loops in the way. This is what it then looks like from the right side of the trousers, with the inside half of the waistband folded up so you can see it’s not attached. 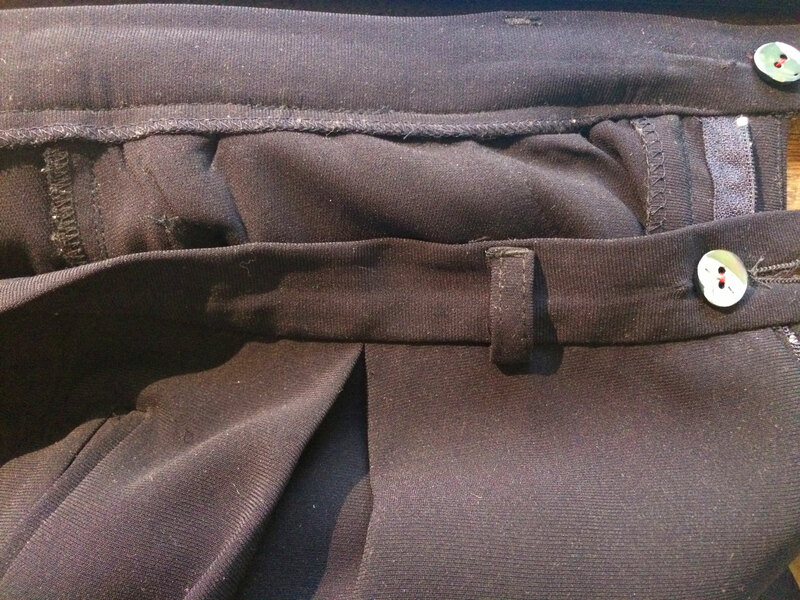 To sew the inside of the waistband down, in the case of my trousers, I pinned it from the outside of the trousers so I could sew it and see what it would look like from the right side. You again need to make sure your belt loops are out of the way. 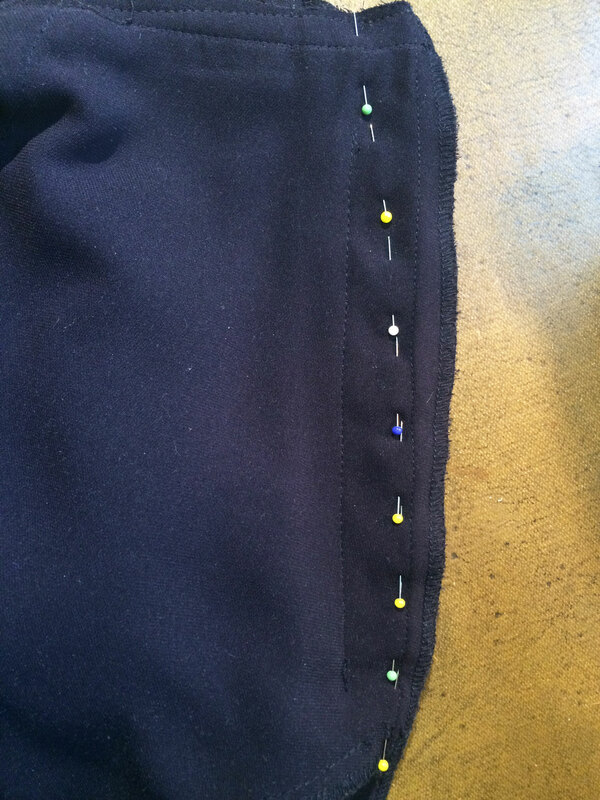 I then used my zipper foot to stitch as close to the seam line as possible. 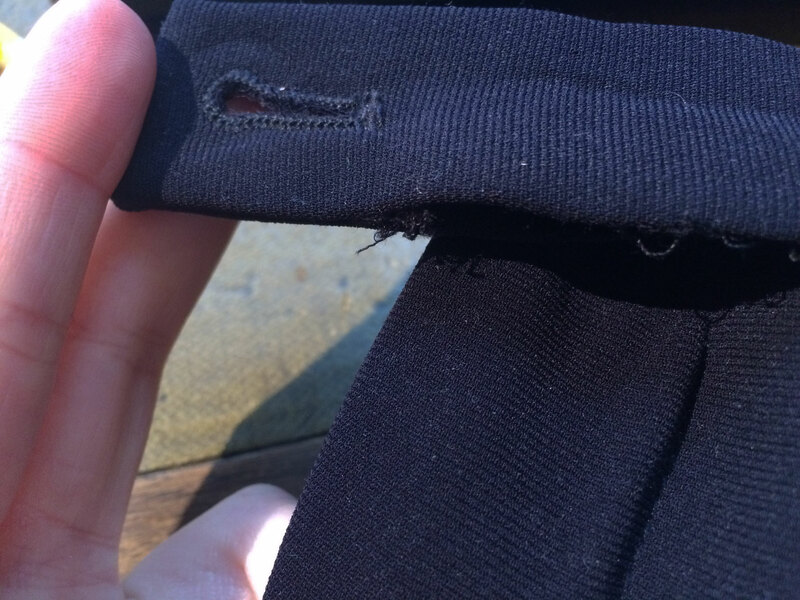 You may want to hand stitch the inside of the waistband to make it invisible. 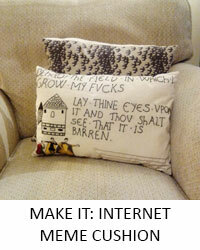 Or you could sew the INSIDE with the seam (right sides together), and then top stitch the outside in place. 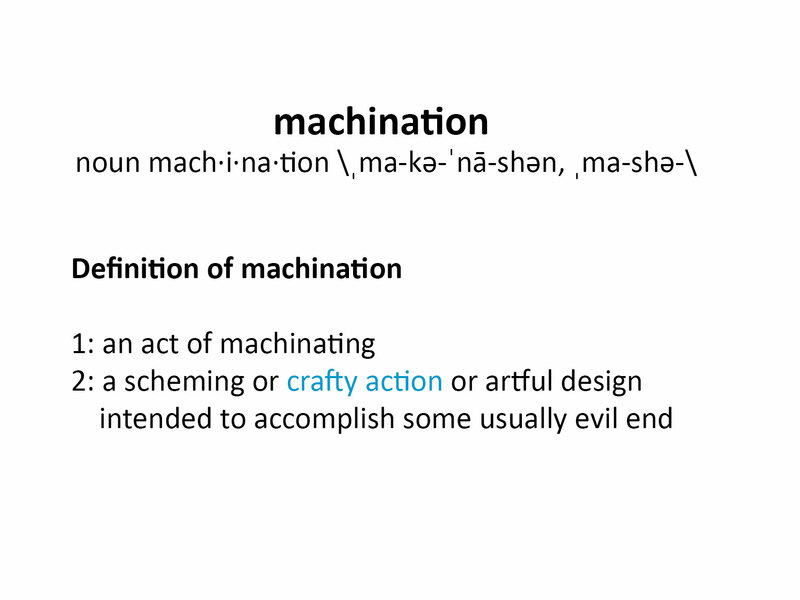 You’ll be informed by the way it was constructed originally. 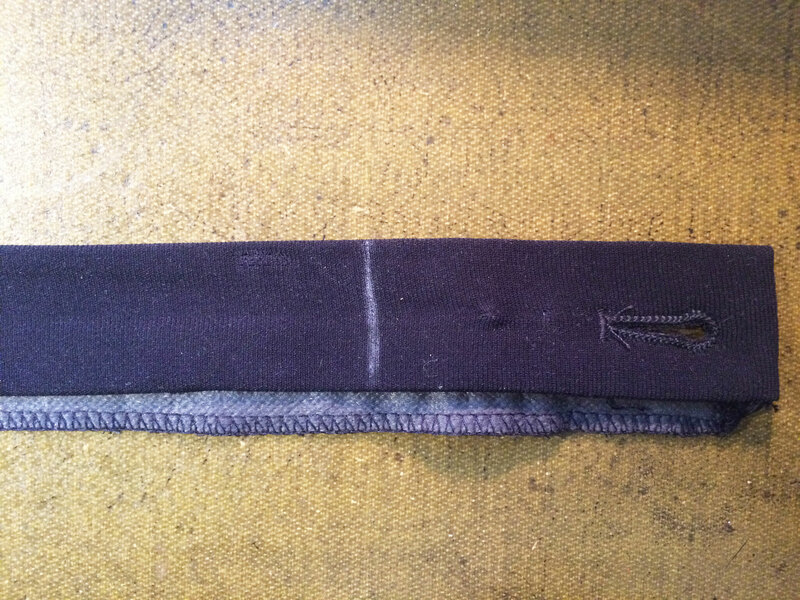 You’ll now want to reattach your belt loops – in my case I just needed to attach them at the top, which I did using a teeny tiny zip-zag stitch. In general the placement for belt loops would be one on the centre back seam, one on each side seam, (possibly one on each side between these 2), and 1 on each side just in front of your hip bones. Now all you need to do is remake any button holes you need to, and sew on any buttons you had to remove when you resized the waistband. Yay! 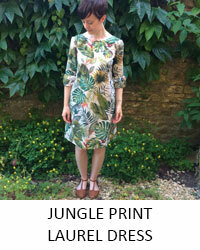 Now you have a newly wearable pair of trousers! Very good advice on taking pictures for reference before taking apart. Word. Thanks! I’ve unpicked things SOOOO many times and then panicked that I can’t remember how to put it back together, so photos are definitely the way to go! Next PostNext I’m doing Me Made May again! Yay!